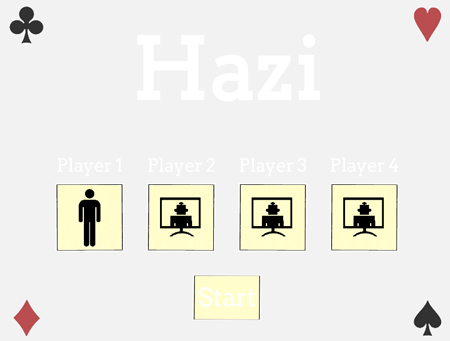 In my family, we'd always played a game we knew as "Hazi". The correct spelling of the name was never known, though. It could have been "Hausie" or "Hozzie", or any number of different permutations. It was a sort of Double Euchre variant, but we couldn't ever found anyone else who really knew the game like we did. So, one year for Christmas I decided to make a digital version of the game for my family to play. My vision was a bit more grand than what I could have accomplished. Even though I created a decent AI for offline single and local hotseat-playing, the online multiplayer mode I had planned for never came to fruition. Hazi is played with a modified pinochle deck: it has every face card for each suit, twice (two jacks, two queens, etc). No number cards are used at all. There are two teams of two players, with partners sitting opposite each other. 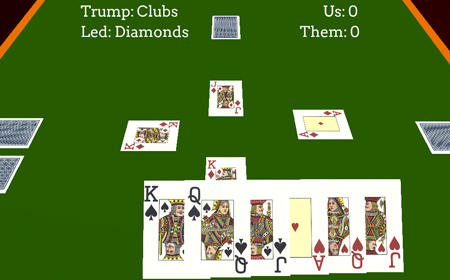 At the beginning of each round, each player is dealt eight cards. Starting to the left of the dealer, players bid on how many of the eight tricks in the round they can take. 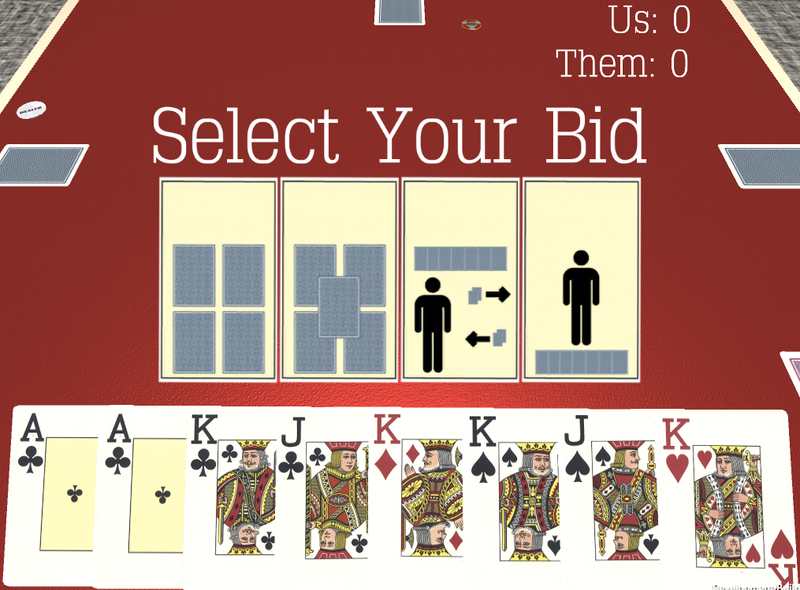 Four and five are safe bids, and then there is a Loner - where the player takes all 8 cards without any help from their partner, and the titular Hazi. 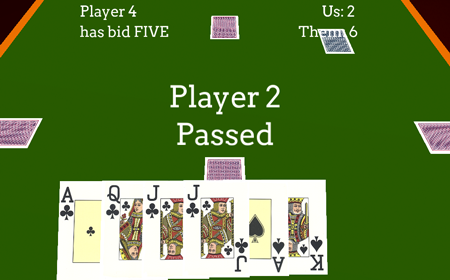 For a hazi, the player who is bidding places two cards from their hand face-down, and only if they win the bid, they get two cards from their partner, who then sits out of the round. Whomever has the highest bid gets to declare the high suit, and then they must take the number of tricks they bid (or more), or else they lose points. When a high suit is declared, the Jacks of that suit become the most powerful card to play (the right bowers), and the jacks of the same color become the second most powerful card (the left bowers.) The rest of the round is played out in a series of tricks, with one player leading with a certain suit, and then each other player playing a card in that suit. If they can't play a card in-suit, they may play out-of-suit, which allows them to jump in with a card from the high suit. Whomever has the highest in-suit card (or highest high-suit card if any were played) wins the trick. At the end of the round points are scored, and the first team to get to 64 points or higher wins the game.